Protect the most sensitive part of your face with the Soothing Eye Contour Cream from Avène, specialists in gentle and sensitive skin care. The eye cream boasts a formula, made up of moisturising and anti-free radical actives, which works to hydrate your eye contour ensuring that the delicate skin is always left in the best possible condition. The powerful yet gentle formula uses the Avène Thermal Spring Water as a base to alleviate tightness and redness, as well as Alpha Bisabolol, which helps to calm the eye contour, and Dextran Sulphate, which calms sensitive eyelids thanks to its well-known cooling properties. 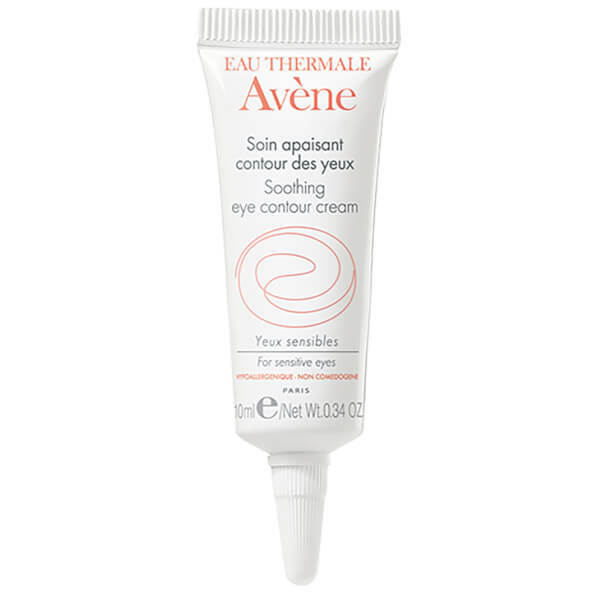 Appropriate for all types of sensitive skin, the Avène Soothing Eye Contour Cream will leave you with perfectly hydrated and protected eyes. Avene Thermal Spring Water (Avene Aqua), Mineral Oil (Paraffin Liquidum), Caprylic/Capric Triglyceride, Cyclomethicone, Glycerin, Sucrose Stearate, Peg-12, Sucrose Distearate, Triethanolamine, Batyl Alcohol, Bisabolol, Caprylic/Capric Triglycerides, Carbomer, Dextran Sulfate, Disodium Edta, Sodium Hyaluronate, Tocopheryl Glucoside.